I woke up this morning and couldn’t think of anything I wanted to eat (say, what?). The other day, I had a really bad headache and grouched my way through the day. The next day, I had bad body aches and shuffled around at home. On the third day, I was tied to the couch and mostly slept. Today I’m on path to recovery(! ), but the only thing I can get myself to eat is congee. 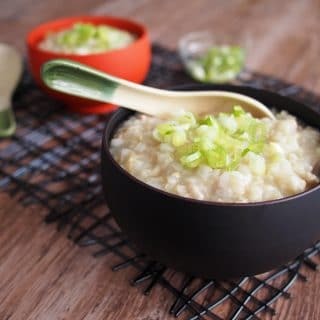 Congee is also known as rice porridge, jook, zhou, xi fan, or even gruel, but I’m going to stick with calling it congee because that’s what I called it growing up. 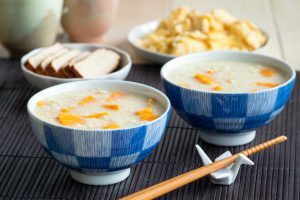 There are many varieties of congee, but in its simplest form, it is rice boiled in a large amount of liquid until it softens and starts to break apart. Chicken and Ginger Congee is one of those dishes that I start craving whenever a cold, the flu or general moodiness hits me. It is so comforting, like the fuzzy blanket I am hidden under while I type this post in my pajamas. 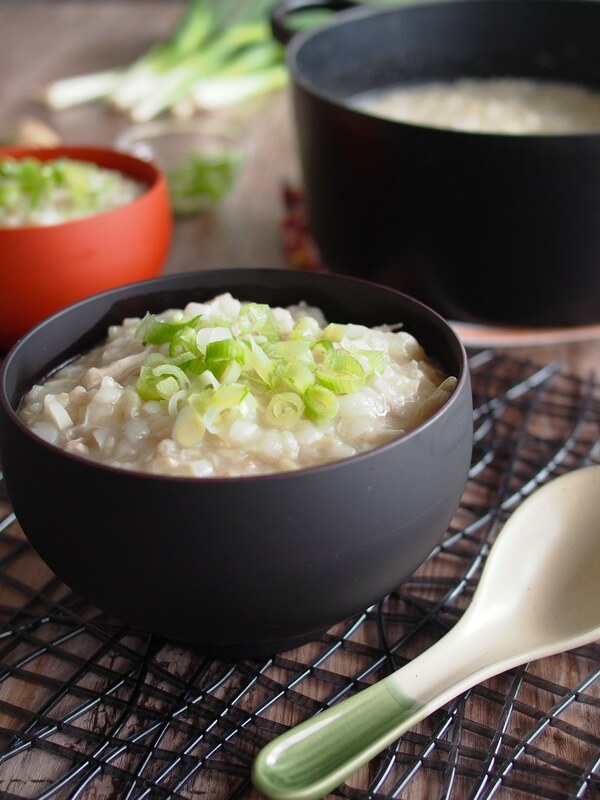 And like the blanket, congee will warm you right through and make you feel safe and sound. Because it is so simple in its most basic form, congee is perfect when you are sick. It’s also easy on the stomach and hydrating because of the large amounts of water used to cook it. And to top that all off, it is so easy to make for yourself even if you are tied to the couch with a box of tissues. 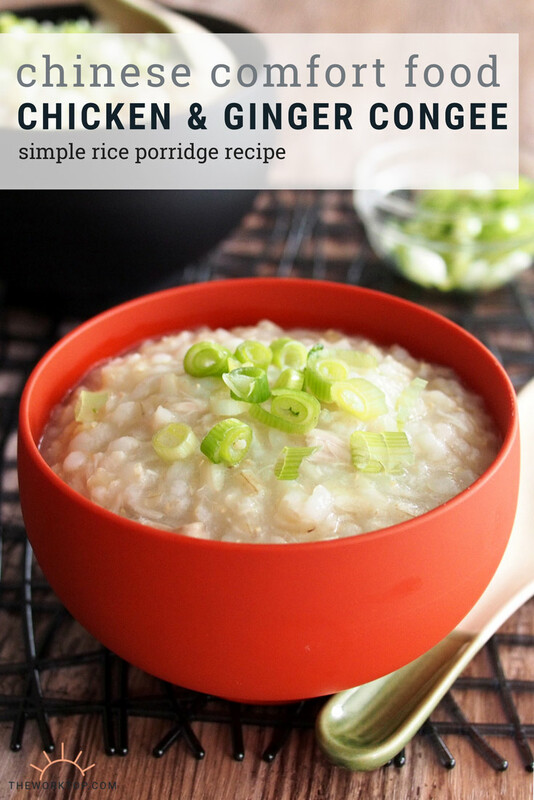 Chinese rice porridge can be eaten anytime of the day, but today, it was perfect for breakfast, or rather, brunch. It takes about one and a half hours to stew, because you want the rice to become fully cooked and broken down. 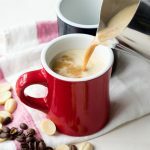 There is a lot of liquid in this recipe because you want it to be hydrating, soft, and nourishing. 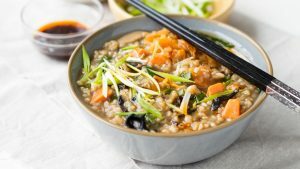 I used brown rice, but it can be made just as easily with white rice. There is a bit more chew to it with brown rice, and it takes a little bit longer. 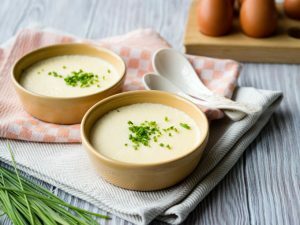 If you want to make quick congee, try this Instant Pot Congee Recipe. It only takes 30 minutes cooking. You can also vary the toppings, but I kept it simple today with just chicken and ginger. Some recipes will call for chicken broth, but I used only water and actual chicken thighs to get my essence of the chicken (that’s what I call the magical healing powers of chicken soup)! 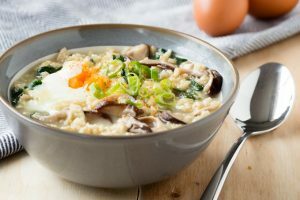 I hope you weren’t looking for a Chicken and Ginger Congee Recipe because you are feeling sick, but if that is the case, I really hope this comforting recipe warms you right up. Hopefully you’ll be on the mend in no time! Rinse and drain the rice. Pour the rice into a heavy stock pot (a cast iron pot works great). Add in the water, ginger and chicken thighs. Bring the pot to a boil then immediately turn down the heat. Allow the pot to simmer, covered, for 1-1 1/2 hours, or until the rice has absorbed most of the liquid and has started breaking apart. It will take white rice about 1 hour, and brown rice about 1 1/2 hours. Remove the chicken thighs into a bowl and allow to cool. When the chicken thighs are cool enough for you to handle, shred the meat and remove the bones. Add the shredded chicken back into the congee and mix well. 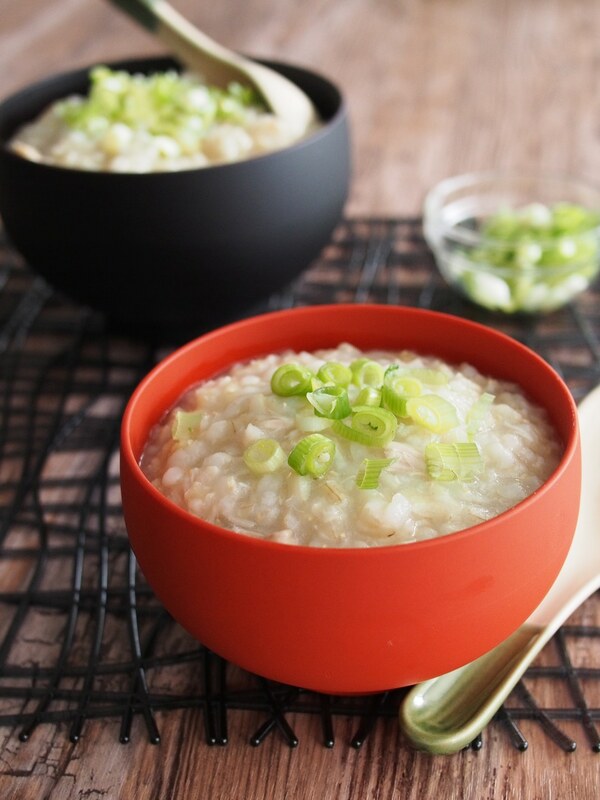 Serve the congee into individual bowls and garnish with green onions, if desired. 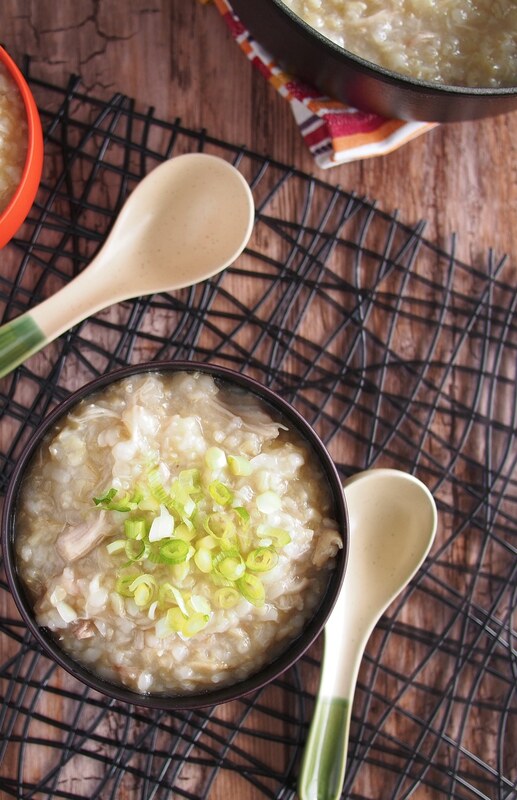 Love this Chicken and Ginger Congee? 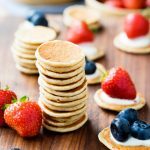 Don’t miss these other Chinese breakfast recipes! Will try this in the rice cooker and let you know the result. I got this last month at Berkeley Bowl, and it was wonderful. I went back for more and it sold out in one morning. One distinctive difference, is their version had WHOLE hard-boiled and peeled eggs in it. That made it much more nutritious. OMG,I just finished the recipe and honestly this is one of the best meals i ever had, especially if you add a lot of garlic in the end. Thank you soo much for the recipe!!! 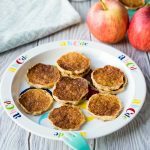 Soo simple and yet soo delicious!!! For the Conjeee preparation, use of broken rice will enable faster cooking. I made this this afternoon – it’ll be for breakfast tomorrow. Topping this congee with sautéed garlic mushrooms, scallions and roasted peanuts sounds amazing! 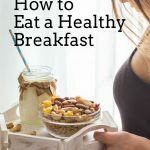 I’ll have to give that a try next time, including the poached egg. Hope you enjoyed! what if i put two cup of rice, the ratio of the water has to be double too? That sounds about right. 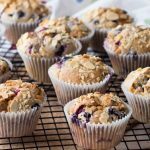 It is a forgiving recipe so you have some room to experiment a bit. You’ll need a big pot though! 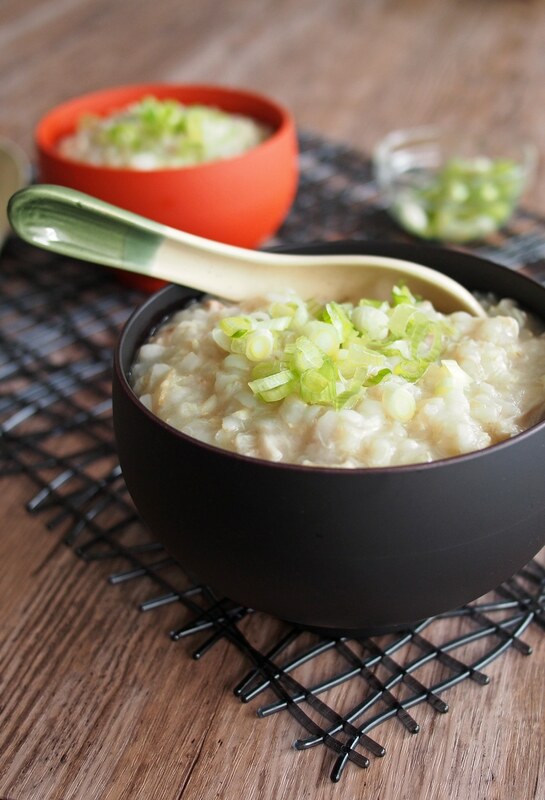 I’ve made this twice already when sick, it’s a wonderfully easy and satisfying congee. This time I added garlic, which although not very traditional was extremely yummy. I really like that the chicken is cooked in the congee. 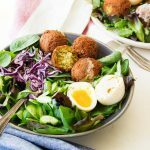 It gives it a nice flavour and makes it a balanced meal without any extra effort. Thank you! 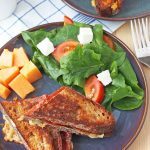 Hi Quinn – I’m so glad to hear that this recipe has helped you feel better when you were sick. It’s such a bummer to be sick, but this congee is always the silver lining I look forward to ;) I’ll give it a try with garlic next time. Thanks for the tip. This sounds like a nice alternative to chicken noodle soup. Question: can I use dried or chopped, refrigerated ginger? If so, what do you recommend? Thanks, Vera. Also, am glad you’re feeling better! Hi Vera, I usually buy fresh ginger and keep it stored in the refrigerator. It should lasts for a while stored in there. 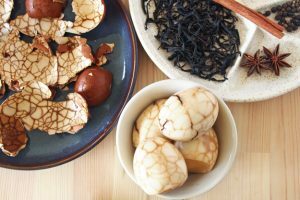 I haven’t tried making congee with dried ginger before, but I’ll try it next time I have dried ginger and let you know! The chicken and ginger congee remind me in Hong Kong. I am going to cook that today. Thanks, Stefanie! Hoping for no more colds the rest of the winter for us. Happy holidays!